28-09-2011 I am currently working on sizes newborn through to x-large, If you would like to test a particular size please message me, thankyou. Please check your tension/gauge BEFORE you try this pattern. If you don’t it will be massive! We want a taught, tight stitch not a loose, gaping stitch. This pattern has been written in British Crochet in a large size with finished garment measurements of Waist = 16 -18 inches, rise = 18 inches, thigh = 10 - 12inches. 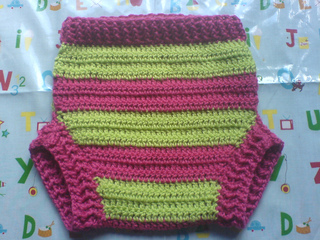 I wrote this pattern in response to a friends enquiry for a crochet soaker not made in the round, without short rows, but with extra room at the back to accomodate a cloth nappy. 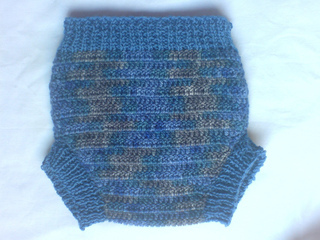 I do plan to add sizes small, medium and X-Large as time allows and to add fully crocheted waist and cuffs.